On The Spot Photos was established in 2009 and photographs over 50,000 event attendees between 100 and 125 events a year. The OTS Photos’ team of dedicated professional photographers and event associates, along with Johnny Miller, print 20,000 event photos on site every year for the past 10 years. OTS Photos is focused on printing professional event photos instantly, that tell a story and commemorate special events, golf outings, galas, and conferences at venues and event locations across the USA! Johnny Miller is an American business entrepreneur and founder of OTS Photos. While whitew ater kayaking in Central America and Africa, he came up with an idea to develop an event photography company that prints branded photocards on location for special events, golf outings and brand marketing promotions. While matriculated at Empire State College in the MBA program, Johnny made OTS Photos a reality, and made it the subject matter of his capstone project. Johnny Miller lives in Saratoga Springs with wife and two kids. His entrepreneurial career began at a young age while growing up in Yonkers, NY, delivering newspapers, landscaping, and restoring classic wooden boats on Lake George during the summers. After graduating from Boston University, he ski bummed in Crested Butte, CO, which eventually led him to co-owning a kayaking and mountaineering outfitter in Saratoga Springs, at the age of 25. In 2002, Johnny realized partners are for dancing and sold his share of the outfitter business. Continuing to forge his own path, Johnny published the first adventure guide book to Saratoga Springs, distributing 40,000 copies between 2003 and 2006. Johnny continued his career in the world of adventure as an event planner for the Great Hudson River Paddle, NYS Canal Splash, and GoZero Kayaking racing series on the Hudson River. 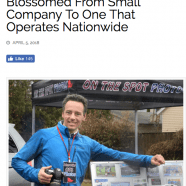 When the economy crashed in 2009, all bets were off for making a living as an adventure kayaker, so he decided to pursue an MBA from Empire State College in order to implement his business plan. On the Spot Photos, formerly PhotoCard Day, was started in 2009 and has continued to grow since.